The School has a 400 mtrs track having eight lanes for athletic events. There is Kho-Kho, Kabaddi court and also provision for playing Basket ball, Football, Volleyball, Handball and Cricket. 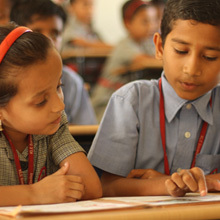 The school has facilities for indoor games like Table Tennis, Carrom, Chess etc.